The design I came up with for this kitchen build features a wall unit and large island facing out into the sitting area. I love the look of the drawers and handles so I made sure there are lots featured. After spending an hour and a half with the laser cutter I came home with a mega puzzle to assemble. I made a different style for the island this time and it might just be my favourite part of the kitchen. I really wanted a double wall oven for this kitchen too. The plan is to put in an order from Elf Miniatures soon. The space to the right is meant to surround a 3" fridge of some kind. As I said I'm undecided if this is the design I'm settling with. Something about it is just off for me. I'd love to hear your thoughts. I tried taking away that extra wall cabinet unit at the end and seeing what my double fridge looked like too. This week I might just leave the kitchen and start laying the floor. I have some website details to finish up too. I ADORE your blog's new look and Im bowled over with your kitchen- WOWZERS! I think that the commercial fridge is such a great idea and I sure hope you'll make kits of both versions for future retail because they're FANTASTIC! What about adding a wine rack on the end of the island? 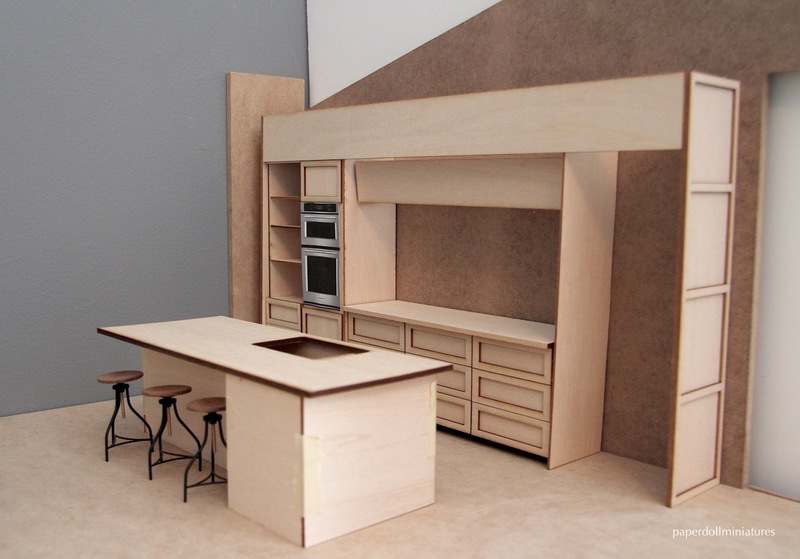 Actually Kristine, I am going to slightly amend my first comment because my REAL hope is that you make Complete Kitchen Kits and not just the appliances, because your skills with the laser cutter make you a Canadian Wonder Woman- YOU GO GIRL! WOAH! This looks stunning! Laser cutting the pieces gives this incredible precision I am aiming for. What kind of laser cutter do you have? Thank you Marion, the laser cutter is definitely something you should look into! I use one at my library for free thankfully so I haven't had to buy one. Have you seen the site Ponoko .com? They offer laser cutting the same way Shapeways does 3D printing. You need to check it out! I love your blog's new look! 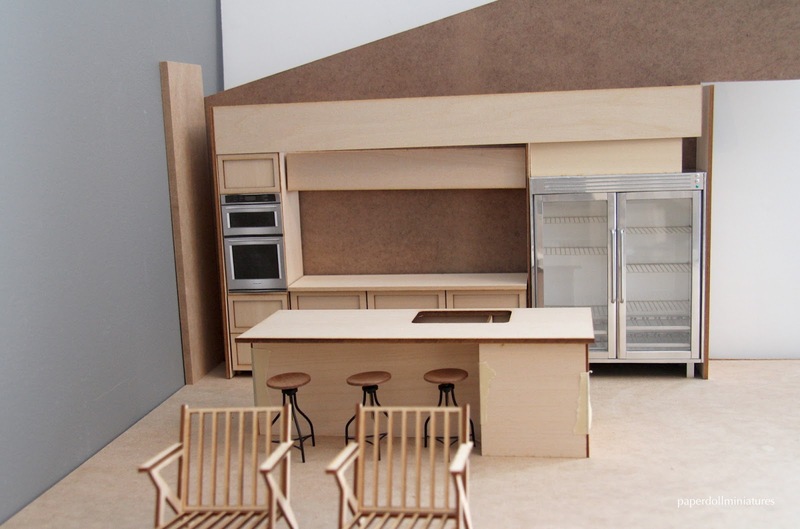 You will build a great kitchen: I like the fridge, chairs and shelving! El diseño e precioso y lo del cortador laser debe ser una gozada. First of all. I'm in awe. I love how it looks and that its all custom... you're amazing. Trying to look past that to give an honest opinion took me a while because I just couldn't get over how cool it was. I think what might be throwing you off is that normally folks place a kitchen sink on the outer wall counters looking out a window. Not doing that gives you a wall of cabinets, and you don't seem to have full size uppers on your wall. So it looks a little uneven because your sink is on the island and you don't have a cooktop or hood on your counter near the stove. I'd try a mock up of a range hood and the stove top, just to see if that gives you the balance you're looking for. I think your other issue is color. Right now, everything is brown, brown walls, brown cabinets...it all blends and looks a little dark. Once you give your cabinets some color, and I'd recommend under cabinet lights as well, things will brighten up. Here's a kitchen in brown gloss that looks airy and open. I think the countertops really help too. Wow...this got long. Sorry. But I still am amazed at how awesome this looks and I can't wait to see your progress on the build. Oh Sheila, thanks so much for all your feedback! It definitely throws me off with all the brown, brown, and brown! 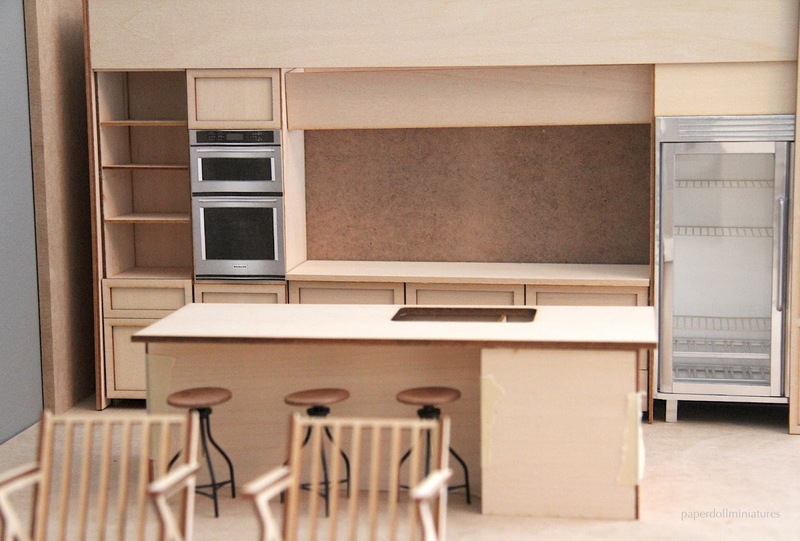 The plan is to have a range cooktop on the wall unit counter... I realized in the comments I forgot to say that! I think you might be onto something with the missing full size uppers. Maybe I need to revisit my upper cabinet heights. I'm hoping that with the roof on, and the walls finished I'll have a better idea. Right now I keep worrying that the design is just too darn big for the space! We'll see next time! I think it looks fantastic. Once it has the final colours I am sure it will look wonderful. Well, first let me say it looks fantastic in any incarnation. :) But in the interests of being constructive/helpful.. Here's a couple of things I would try.. they may work, they may not.. but may as well give it a go right? 1. I would try the fridge at the other end up by the sidewall. It's a large piece and as wonderful as it is, it might be overwhelming the aesthetic up front near the doorway. Then switch the oven and shelf unit down towards the door, with the shelves at the end. You could even open up the end wall of the shelves so they are open at the side as well as the front next to the doorway. Then you could fill them with overhanging plants or statement china/crockery.. and it would open up that end a bit if you are feeling enclosed currently. 2. 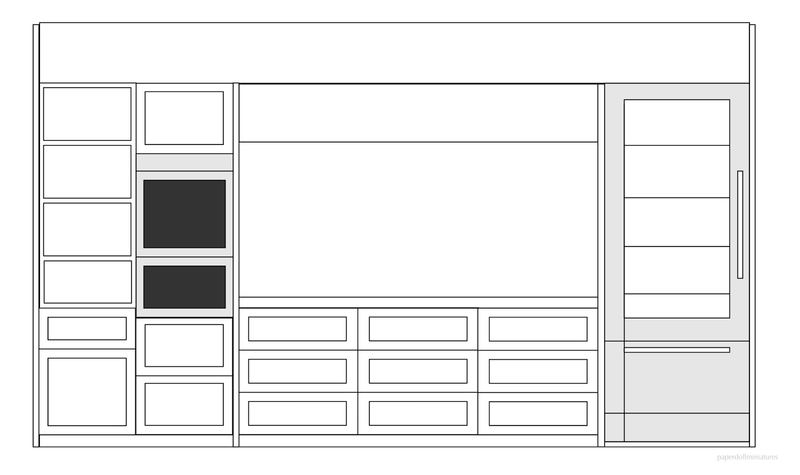 The other slightly different layout option is have the fridge as mentioned above but this time only move either the shelving or the oven unit to the other end. this way the centre section is encased in two equal units which will make it feel more symmetrical by differentiating the fridge as outside this zone. My preference would be to move the shelf unit to the door end and leave the ovens next to the fridge, but it's not very energy efficient to have those two appliances together :) and it might be too much appliance at one end for your preference for symmetry. 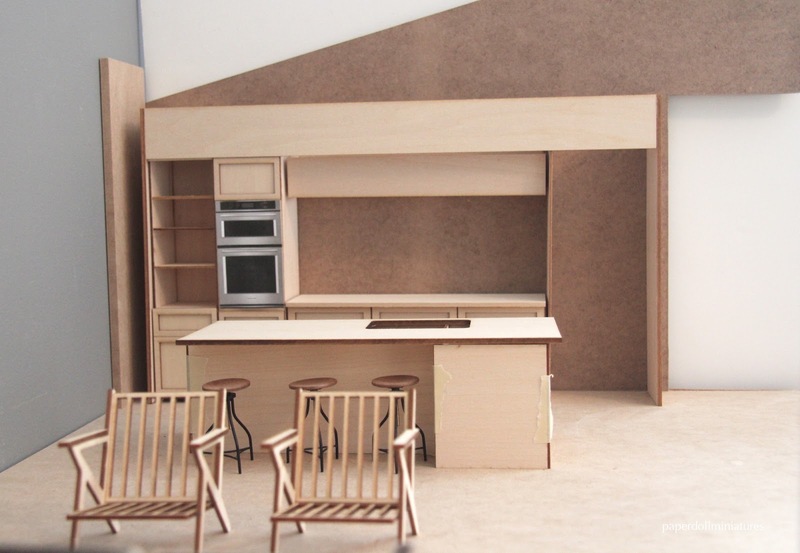 It would allow the shelves to open up that end of the kitchen though. 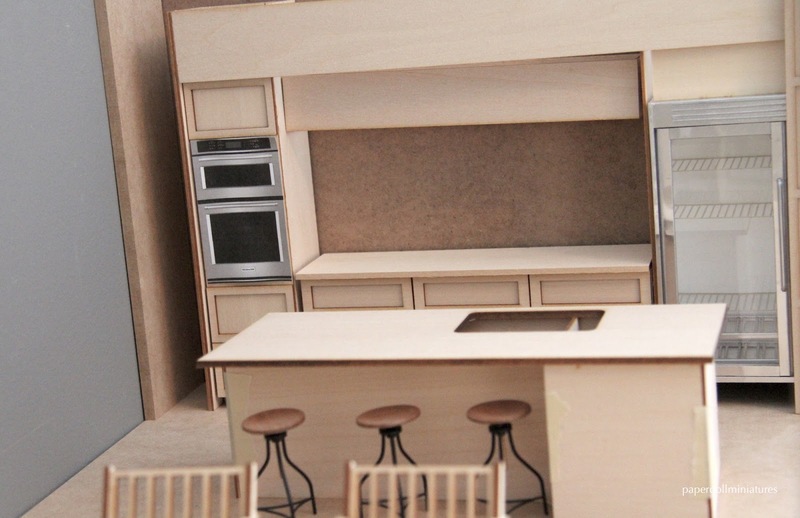 With this design, you could also try off centering the island from the whole kitchen to now centre on the symmetrical oven/shelf/range section.. This type would match the shape of your drawers better also. I would definitely do some kind of glass in them though to break up the solid features. 4. How about some shelving in that block under the island adjacent to the stools (great stools btw) It's a large block at the moment and may make the kitchen feel larger because it's solid. Some shallow shelves facing out to the living room might alleviate that. Those chairs are awesome! As is the kitchen however I'm undecided too...I like the extra storage space, but that fridge is so great that I would want to use it whenever I could. Looks great to me! I'm jelly about the laser cutter. I still have the peninsula of my kitchen to make and boy would that make it look better. Not sure I want to invest in one though, as I don't know how much I would actually use it. Thank you, it's a great machine to get precise edges and cuts! If you ever want to try without actually buying one (they are so $$$ :( to buy) check out an online shop like Ponoko .com. 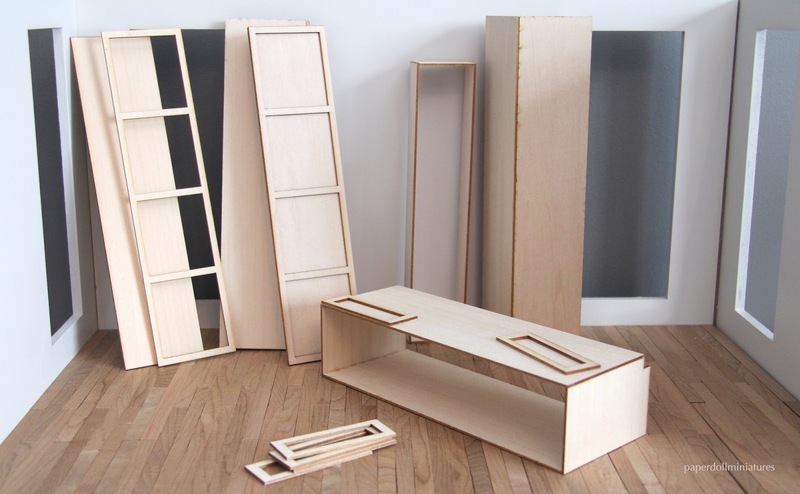 You submit your design and pick your material, and a few days later it's shipped to your door! I used them before my local library got a makers space and offered the service.